The diagram below shows most of the different components that work together to form the H2O software stack. The diagram is split into a top and bottom section, with the network cloud dividing the two sections. 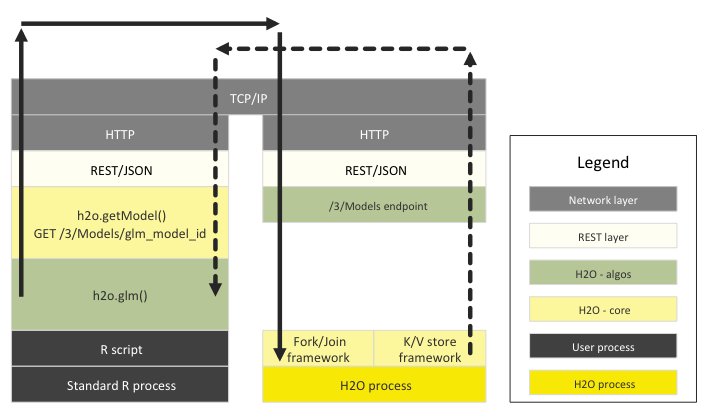 The top section shows some of the different REST API clients that exist for H2O. The bottom section shows different components that run within an H2O JVM process. The color scheme in the diagram shows each layer in a consistent color but always shows user-added customer algorithm code as gray. All REST API clients communicate with H2O over a socket connection. R scripts can use the H2O R package [‘library(h2o)’]. Users can write their own R functions that run on H2O with ‘apply’ or ‘ddply’. Python scripts currently must use the REST API directly. An H2O client API for python is planned. An H2O worksheet for Microsoft Excel is available. It allows you to import big datasets into H2O and run algorithms like GLM directly from Excel. Users can pull results from H2O for visualization in Tableau. H2O Flow is the notebook style Web UI for H2O. An H2O cloud consists of one or more nodes. 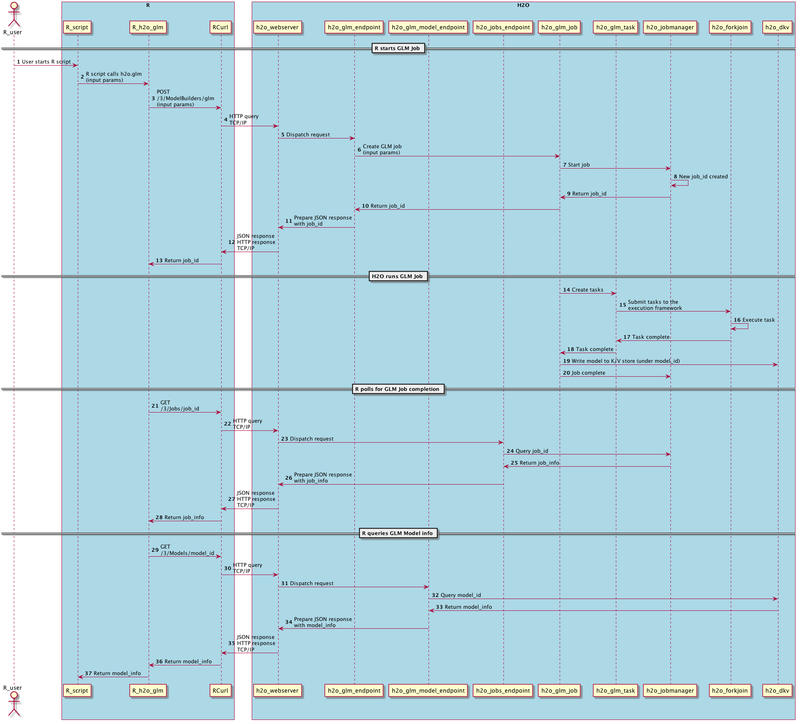 Each node is a single JVM process. Each JVM process is split into three layers: language, algorithms, and core infrastructure. The language layer consists of an expression evaluation engine for R and the Shalala Scala layer. The R evaluation layer is a slave to the R REST client front-end. The Scala layer, however, is a first-class citizen in which you can write native programs and algorithms that use H2O. The algorithms layer contains those algorithms automatically provided with H2O. These are the parse algorithm used for importing datasets, the math and machine learning algorithms like GLM, and the prediction and scoring engine for model evaluation. The bottom (core) layer handles resource management. Memory and CPU are managed at this level. A Frame is an H2O Data Frame, the basic unit of data storage exposed to users. “Fluid Vector” is an internal engineering term that caught on. It refers to the ability to add and update and remove columns in a frame “fluidly” (as opposed to the frame being rigid and immutable). The Frame->Vector->Chunk->Element taxonomy that stores data in memory is described in Javadoc. The Fluid Vector (or fvec) code is the column-compressed store implementation. Atomic and distributed in-memory storage spread across the cluster. Used in the K/V store implementation. Jobs are large pieces of work that have progress bars and can be monitored in the Web UI. Model creation is an example of a job. MRTask stands for MapReduce Task. 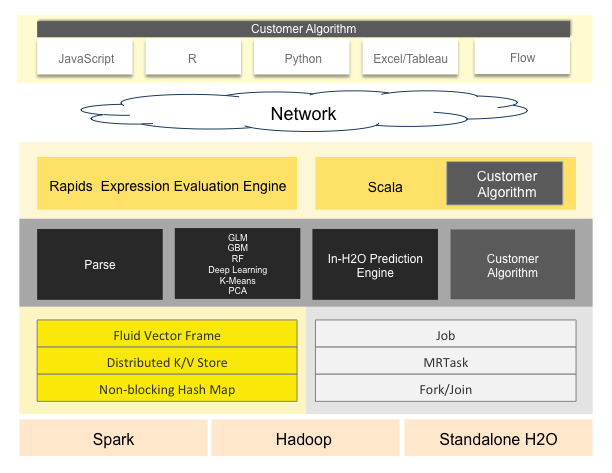 This is an H2O in-memory MapReduce Task, not to be confused with a Hadoop MapReduce task. A modified JSR166y lightweight task execution framework. The H2O package for R allows R users to control an H2O cluster from an R script. The R script is a REST API client of the H2O cluster. The data never flows through R.
Note that although these examples are for R, Python and the H2O package for Python behave exactly the same way. 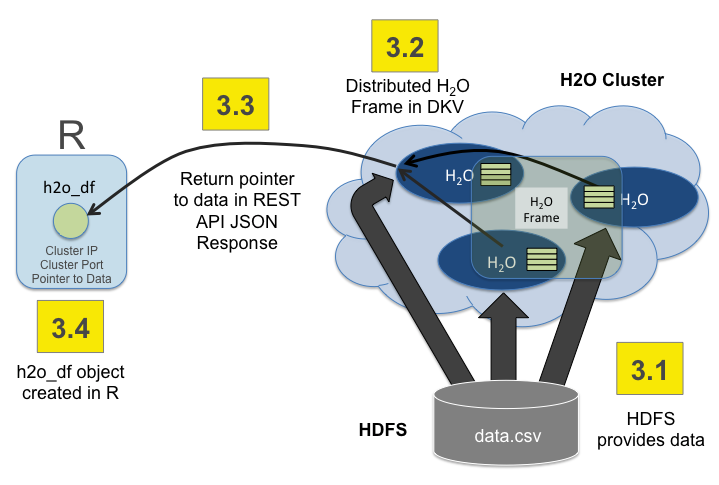 The following sequence of three steps shows how an R program tells an H2O cluster to read data from HDFS into a distributed H2O Frame. The thin arrows show control information. The thin arrows show control information. The thick arrows show data being returned from HDFS. The blocks of data live in the distributed H2O Frame cluster memory. The following diagram shows the different software layers involved when a user runs an R program that starts a GLM on H2O. The left side shows the steps that run the the R process and the right side shows the steps that run in the H2O cloud. The top layer is the TCP/IP network code that enables the two processes to communicate with each other. The solid line shows an R->H2O request and the dashed line shows the response for that request. An end-to-end sequence diagram of the same transaction is below. This gives a different perspective of the R and H2O interactions for the same GLM request and the resulting model. An H2O data frame is represented in R by an S3 object of class H2OFrame. The S3 object has an id attribute which is a reference to the big data object inside H2O. The H2O R package overloads generic operations like ‘summary’ and ‘+’ for this new H2OFrame class. The R core parser makes callbacks into the H2O R package, and these operations get sent to the H2O cluster over an HTTP connection. 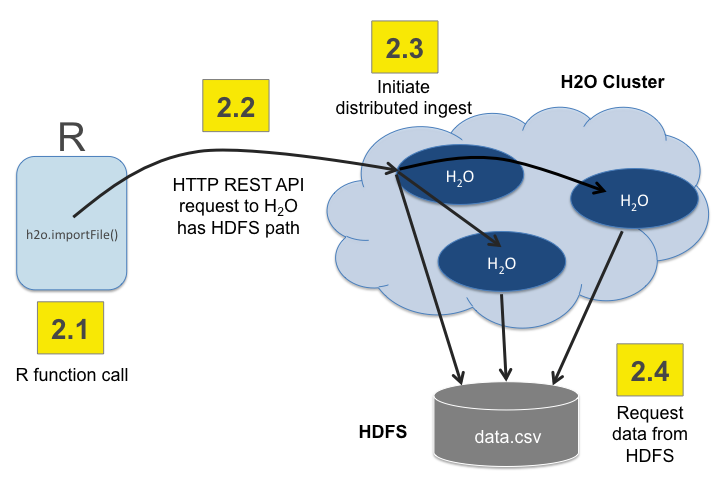 The H2O cluster performs the big data operation (for example, ‘+’ on two columns of a dataset imported into H2O) and returns a reference to the result. This reference is stored in a new H2OFrame S3 object inside R.
Complicated expressions are turned into expression trees and evaluated by the Rapids expression engine in the H2O back-end.